BS, Chemistry, Hofstra University, Hempstead, NY, 1961. PhD, Chemistry, Polytechnic Institute of Brooklyn, Brooklyn, NY, 1967. NIH Postdoctoral Fellow, Univ. of Liverpool, Liverpool, England, Oct. 1966–Sept. 1967. Horace H. Rackham Postdoctoral Fellow, Univ. of Michigan, Ann Arbor, MI, Aug. 1967 – Aug. 1970. Chief Science Officer, Rochal Industries LLC, 2014-present. Chief Scientific Officer, Rochal Industries LLP, 2004-present. Vice President & Special Advisor, Bausch & Lomb, Rochester, NY, July 2005-Feb. 2006. Vice President of Research, Bausch & Lomb, Oct. 2000-July 2005. Editor-in-Chief, Polymeric Materials Encyclopedia, CRC Press, Inc., 1993-1997. Co-Founder Polymer Technology Corporation, Wilmington, MA, 1972-83. Dean, College of Pure & Applied Science, 1981-84. Acting Dean, College of Pure & Applied Science, 1978-81. Chairman, Council of Deans, 1982-83. Chairman, Department of Chemistry, 1974-78. Administrative Secretary, Macromolecular Research Center, 1968-70. 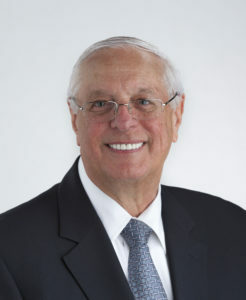 Professor Emeritus, 1989 – present. POLY Fellow, Division of Polymer Chemistry, American Chemical Society, March 2010. Pacific Polymer Federation Award, December 5, 2007. Clemson Award for Applied Biomaterials, Society For Biomaterials, March 2006. Fellow, American Institute of Medical and Biological Engineers, Feb. 2005. Sesquicentennial Medal, Polytechnic University, Sept. 29, 2005. H.F. Mark Technology Award, Polytechnic University, May 2005. American Chemical Society Award in Industrial Chemistry, April 2004. My principal areas of research include the synthesis and properties of new biomaterials designed for commercial biomedical applications. Approximately 50 products have been commercialized worldwide in ophthalmology, including rigid and soft (traditional) contact lenses, silicone hydrogel contact lenses, contact lens care solutions and cleaners, intraocular lens materials, intraocular controlled drug delivery, topical/intraocular anesthesia, and in wound, burn and skin care, as non-stinging, spray-on liquid bandages for topical skin protection and scar reduction. Current areas of research and development activity pertain to cell-compatible substrates for wound healing, regenerative medicine, antimicrobial materials for biofilm reduction, antimicrobial coatings, burn pain treatment, transdermal drug delivery, and necrotic wound debridement. To date, 212 U.S. Patents and (non-duplicative) U.S. Patent Applications have been issued and pending, as well as approximately 800 International Patents and Applications.